Piero Manzoni, whose project was to make “invisible” paintings, first produced monochrome Achromes then works enclosed in tins. He first tinned his “Lines”, drawn on rolls of paper of varying length. The idea takes over from the hidden form, highlighting the question of the viewer’s confidence in the title given by the artist. 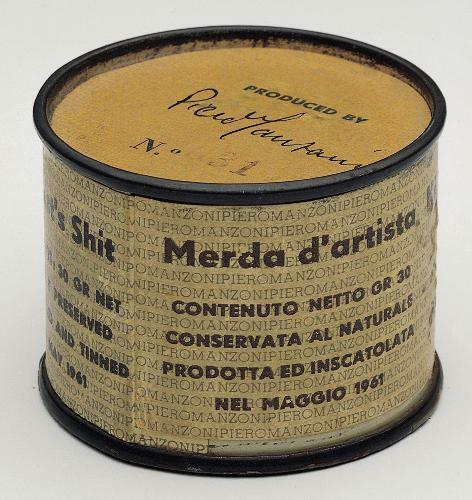 The same scheme is employed in Manzoni’s most notorious work, the series of Merda d’artista: 90 tins each containing 30 grams of his own excrement, sold then by weight, at the going price of gold.